Joshua Corey’s brilliant and disturbing, sometimes “futuristic” Hannah and the Master reminds us with every word and trope that we are living, as he puts it, in the “night of human forgetting.” Radiating out from the decades-long complex and confounding relationship between Hannah Arendt and Martin Heidegger, Corey creates a multi-layered and agonized series of reminders including everything from youthful love to the Nazis to the dark dimensions of our current and future cultural and eco-political fate, one in which Arendt, the major heroine of this work, becomes an “emigrant as pariah” transformed into a “replicant of herself.” In the doubled and tripled dimensions of this work—a riff on Charles Olson evokes the archaic, and a character named THE WAVE embodies the foreboding forces of human extinction–Corey echoes a Dante set on a reverse path. “I wish to say,” he writes,” that midway through our life’s journey we have misplaced literacy, the soul, right terror for angels.” His vision is a warning, delivering us, in Corey’s precise yet feverishly beautiful language, not into Paradise but an impending disastrous Apocalypse. “Who may reach into the depths of terror, but lovers?” asks the MASTER in Joshua Corey’s spellbinding new collection. The question unfolds and folds back on itself multiplying in breathtaking, visionary waves. In this erudite and unflinching landscape, the characters (Hannah Arendt, Martin Heidegger, Simone Weil, to name a few) exist both at the margins and at dead center of the 20th century’s furious catastrophes. Being and non-being, poetry and philosophy, fiction and nonfiction, prayer and play, crash into each other creating luminous shards of history, desire, and heartache. Structured like an epic riddle, this book is the perfect mirror in which to discern the resurgence of fascism today. 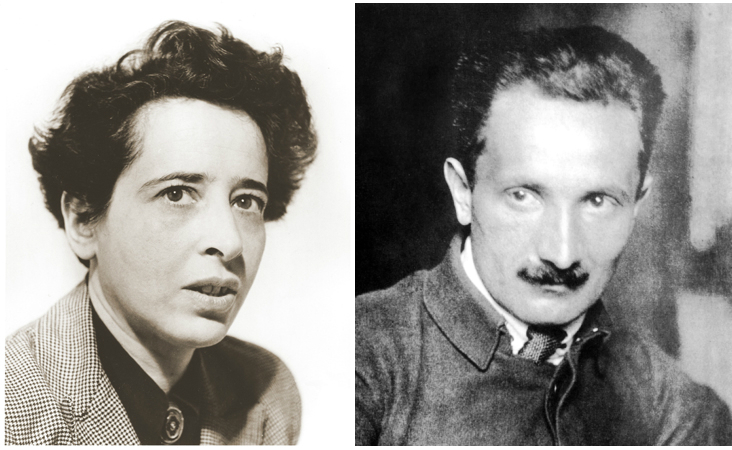 Hannah and the Master begins with the dark attraction that held that least-likely pair, Hannah Arendt and Martin Heidegger, in mutual orbit through the most troubling decades of a troubled century. But it’s the mix of Corey’s materials that steals the show in Hannah and the Master: journeys to the underworld; ecological anxiety; the aesthetico-political thought of the Jewish 20th century; Hannah’s writings to Martin; Martin’s writings to Hannah; and, of course, Blade Runner all take turns on the stage. What’s remarkable is the degree to which this all coheres. As I turned these pages, my thoughts ran to William Blake and his prophetic poems on France and America. There, as here, an unredeemed world slouches toward apocalypse, and real people stand revealed, not in the light of history, but in the aspect of eternity. Corey’s Arendt is a witchy presence, and like a true goddess, manifests in a thousand forms, some of them fearsome. It’s growing darker out there, people, and only Hannah Furiosa can save us now. Read this and you’ll understand. A collection of critical prose on poetry, literature, the poet's novel, utopia, and other questions going back to the heroic age of poetry blogging, now available from MadHat Press! Click here to learn more. "After brief flirtations with the vocations of astronaut, airline pilot, and 'guy in a white coat holding a foaming test tube,' at the age of twelve I decided I wanted to be a writer and I’ve basically never looked back." "Poets know that plot is at best an accomplished divertissement, at worst a distraction, a self-justifying invitation to ignore the exotic, coaxing lure of words--the evocative musical surface of the text, the immediacy of vowels and consonants at serious play--and to ignore the clean world-ness of images themselves--the density of immersion in event, the collisions of angles, forms, and color that become, within the curious dynamic of memory, the past that, in turn, shapes (and distorts) the integrity of the self. Make no mistake--Joshua Corey is a poet, testified to not only by his four volumes of spare and brittle poetry but by his achievement here, his first novel." A new translation of Francis Ponge's seminal 1942 book of prose poems, Le parti pris des choses, published by Kenning Editions. Get your copy direct from the publisher, from Small Press Distribution, or if you must, from Amazon. Read my essay "Trying to Translate Ponge" and two poems from the book at the Poetry Society of America. For the third June in a row I'll be teaching a summer course in novel writing at Lake Forest College. Click here for details. A new chapbook of poetry available exclusively from the publisher, Goodmorning Menagerie. Click here to learn more. The Barons, my fourth poetry collection. Beautiful Soul: An American Elegy, a novel. Description: Joshua Corey reads from his novel Beautiful Soul: An American Elegy at Buffalo Street Books, Ithaca, NY on July 10, 2014.